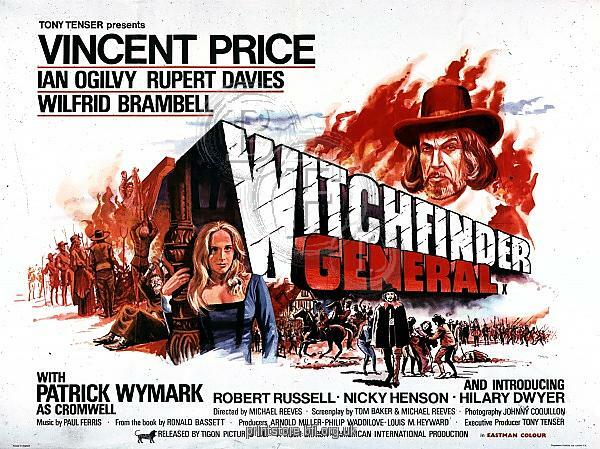 This morning I was the first of three speakers at the Fear in the Fens Film Festival in Downham Market, introducing the classic 1968 horror film Witchfinder General, which was famously filmed on location in East Anglia. My talk, entitled ‘Witchcraft in East Anglia: introducing Witchfinder General‘, told the story of the real Matthew Hopkins and his witch-hunt in East Anglia between 1645 and 1647, which remains the only true witch-hunt in English history. Although small in comparison with Continental witch-hunts, Hopkins’ campaign was made possible by the breakdown of law and order in the ‘Eastern Association’ (Essex and East Anglia) during the English Civil War. I argued that, although Puritanism gave birth to seventeenth-century witchfinding in England, it also ultimately brought it down because Hopkins went beyond the Bible and mingled Puritan ideas with East Anglian folklore (for example the idea of blood-sucking imps as demonic familiars). Eventually, the financial cost of sustaining witch-hunts, the shaky theological grounds of Hopkins’ investigations and the legal difficulties of prosecuting an invisible crime – not to mention Hopkins’ own death in August 1647, brought the witch-hunt to an end. Was in the fourth row listening to you Dr. Young, very interesting, informative and dare I say it, entertaining talk you gave. Really enjoyed it and it started the day off fantastically, thanks for that. Many thanks for your kind words Nick, and for coming to the talk. I hope you enjoyed the film! I was at this excellent event. Your talk was really fascinating, thank you very much. I especially liked your suggestion that a more faithful telling of Mathew Hopkins’ activities could have captured his zealotry, and so have been more truly frightening than Price’s sadistic villain. Many thanks for your kind words Richard, and thanks for coming. I hope you enjoyed the film!